with easy access from Coleman’s Bridge on the nearby A12. Our wide and varied fish stocks include an abundance of Carp, Tench, Roach, Rudd, Bream, Crucian Carp, Chub, Gudgeon, and Pike (in the river and cottage lake only). 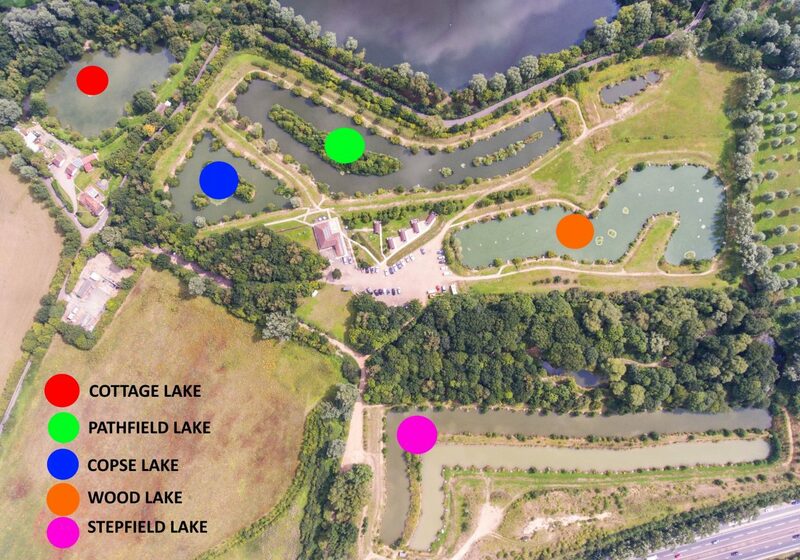 All the lakes are fishable on a day ticket, which is available at the lake. The lakes are also available for club and match bookings and for corporate events etc. Facilities include, on site tackle shop, restaurant (fully licensed) and toilets including facilities for disabled anglers. There are 19 permanent pegs approx 14 metres apart. The depth varies between 2ft 6ins and 4ft. The lake is bunded around and can be reached by shallow slopes. There are 36 permanent pegs approximately 14 metres apart. There is 1 long island down the centre of the lake with a break in the middle and some smaller islands. The depth varies between 3ft and 4ft 6ins. The lake is bunded around and can be reached by steps or slopes. Stocked with carp to 10lb, F1s, Ide, tench, skimmer bream, gudgeon, chub, roach, barbel, rudd & crucian carp. There are 40 permanent pegs approximately 14 metres apart. There are numerous small islands down the centre of the lake. The depth is around 5ft with some hidden depths of up to 6ft. Stocked with carp to 10lb, tench, F1s, Ide, chub, skimmer bream, perch, roach, barbel, rudd & crucian carp. The lake is an older established lake. Stocked with carp to 22lb, tench, bream, perch, eels, golden tench, roach, rudd & ghost koi. Stepfield 1 has 1-33 pegs & Stepfield 2 has 34-62 pegs. Stocked with carp, bream, roach, tench, ide, f1s and brown goldfish. all pegs are 17 metre’s to the island 6′ deep and approximately 2′ deep down the margins. We now have caravan pitches on site with 240v Hook-Up.